The Wii U has had a diverse range of artistically-driven download games ported to its eShop lately, from Another World to Master Reboot to the news that the critically-acclaimed Gone Home will be arriving later this year, and Vancouver-based studio Over the Moon's new adventure The Fall follows that welcome trend after a well-received release on Steam back in May. While it's nowhere near perfect, The Fall is a pleasing addition to the Wii U's repertoire. On a surface level it's is a dark sci-fi 2D adventure game with action elements thrown in: you control a dude in a space suit (who looks suspiciously like one of the Federation Marines from Metroid Prime 2) who shoots robots and pulls levers to advance the story. Been there, done that, right? But wait... you're not the dude in a space suit. You are the space suit. The aforementioned character has been critically wounded and knocked unconscious – instead you play as A.R.I.D., his suit's advanced onboard artificial intelligence unit, in a literal out-of-body experience. The meta-textuality only grows from there. The game is presented from the perspective of the AI, so all of the menus in The Fall look like old DOS screens full of ASCII coding, reminiscent of the dusty computer consoles in Fallout 3. The pause menu includes the "Operating Parameters", which always displays the core rules of "must not misrepresent reality," "must be obedient," and "must protect active pilot," echoing Isaac Asimov's iconic Three Laws of Robotics. As you can expect, The Fall is all about playing with concepts of artificial intelligence and robot sentience. This is a pretty common theme in science fiction that risks becoming played-out and predictable, but The Fall's twist is that unlike most games that tackle similar subject matter, you're not a human; you yourself are one of the robots grappling with their own intelligence. Most of A.R.I.D. 's interactions are with other robots, whether it's fighting enemy security bots, taking the battery from a fellow combat suit whose pilot has died, or debating with computer systems about the idea of robot morality. It all makes for a visually striking experience. 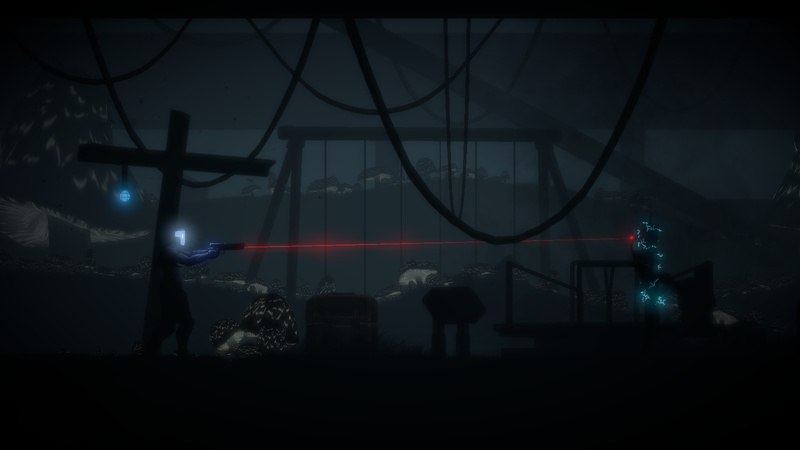 The stark two-dimensional underground environments are presented largely in Limbo-style silhouette, and the entire screen will glitch out and warp at critical moments to remind you you're playing from the perspective of a computer. Perhaps because of this, though, some parts of the experience feel rigid and overcomplicated. At first glance The Fall plays like a platformer, with the left control stick for movement and "B" to jump, but at its core it's an adventure game; the right control stick lets A.R.I.D. scan the environment with the flashlight for clues and objects to interact with, in the vein of Super Metroid's X-Ray Scope (explored further with the 2D version of Metroid Prime's scan visor in the "Metroid Prime 2D" fan project a few years ago). It's a great way of slowing the pace of the game, but because of the visuals' stark colour palette it's often difficult to distinguish objects from one another – you'll often find yourself scanning everything blindly in the hope of finding something with which to interact. It's also obvious that The Fall was designed with PC in mind first, as the translation to Wii U controls (with support for both the GamePad and Pro Controller) is unfortunately clunky. To interact with a scannable object requires three button presses: holding the right stick to look at the object, holding the R button to pull up the interaction menu, and then using the left stick to select an interaction gets old very quickly. Combat is unwieldy, with a click of the right stick required (while you're already holding it in a given direction) to switch from your flashlight to your weapon. Taking into account how much of the screen is taken up by A.R.I.D. 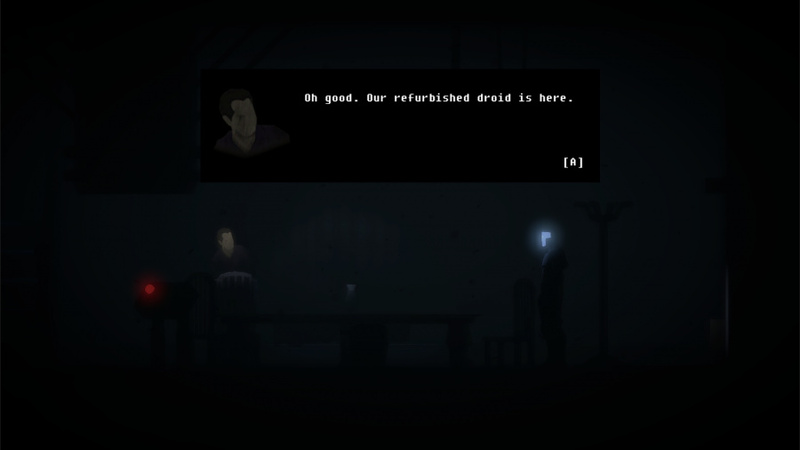 's large, poorly-animated character sprite – a tall, slender model evoking Another World – it's strange A.R.I.D. possesses no crouch ability. While it's by no means a deal breaker, it's also disappointing that there's no D-Pad support at all, especially considering The Fall's old-school digital menu aesthetic. The other major stumbling block of The Fall is its voiceover work. The unique story is done a disservice by the over-acted, clichéd voice acting; perhaps it would've been wiser to take a cue from The Fall's retro influences and forego voice acting entirely in favour of text-based dialogue. The text itself is fairly interesting – multiple-choice branching dialogue trees can feel stale and unrealistic, but it all fits perfectly in the context of A.R.I.D. being a computer programmed to give the most logical possible responses. There's a clever piece of writing early on where there's an option for A.R.I.D. to either tell the truth or lie in a response, in which the game plays with a gamer's expectations; little touches and smart moments are littered throughout the experience. 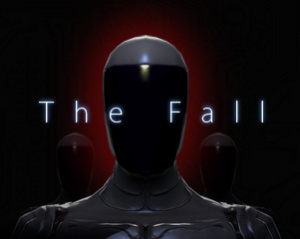 The Fall is a flawed title marred by questionable voice acting, disappointing controls and, in classic adventure game fashion, segments where you'll find yourself rummaging blindly through the environment trying to figure out what to do next. If you can get past all of this, though, you'll find an innovative title with atmospheric visuals that puts a unique spin on old science fiction tropes through an intriguing storyline and some great meta-textual moments with the user interface. If all you want is a solid action-adventure experience, The Fall is probably not your best choice, but if you're looking for a more cerebral change of pace you should check this one out. Too bad. Looks like I'll get the PC port instead. Bleh. Never cared for this genre. This game was awesome, I could not put it down. I would love more of these classic adventure games with interesting stories. Totally made my weekend last weekend. I didn't think the voice acting was bad at all... My playthrough had some freezing though. Different tastes, folks. The voice acting was actually one of the game's highlights for me. And I did not find the controls for interactions to be bothersome at all. This was one of the best and most gripping games that I've played in a loooooong time. I've been continually thinking about it ever since completing it and I feel like it is something that I'll end up replaying many times. Reminds me of Gemini Rue, and I LOVED that game (/story). I need some good story games to tide me over until Zelda U! Really liked this game. Hoping they follow through and make the next episodes. Had no major issues with the controls or the voice acting. Though wiimote support would be very welcome. still waiting for an EU release date..
With all the things this review lists as flawed or badly ported I would have thought the score to be lower.. but it goes in line with other reviews here, where games that are no more than decent can recieve a 7 or 8.
still getting it when it shows up here, been battling myself since may not to get it on steam. I've been looking forward to this for a long time..
Cripers! That trailer was so atmospheric I nearly swallowed my teeth! 7 out of 10? I'm actually really enjoying the game. And I quite like the voice acting. "questionable voice acting"? Personally i think the voice acting was great,for some reason the acting were perfect for each character,and it made them feel alive.But still 7 out of 10? I would have given the game an 8 cause the only problem i had with it was the glitches. The first thing that came to my mind when I saw the title of the game was that unpopular Gorillaz album under the same name. It's my favorite though. Game is good, and the album is amazing. I'll join others in saying that voice acting was never a problem for me. 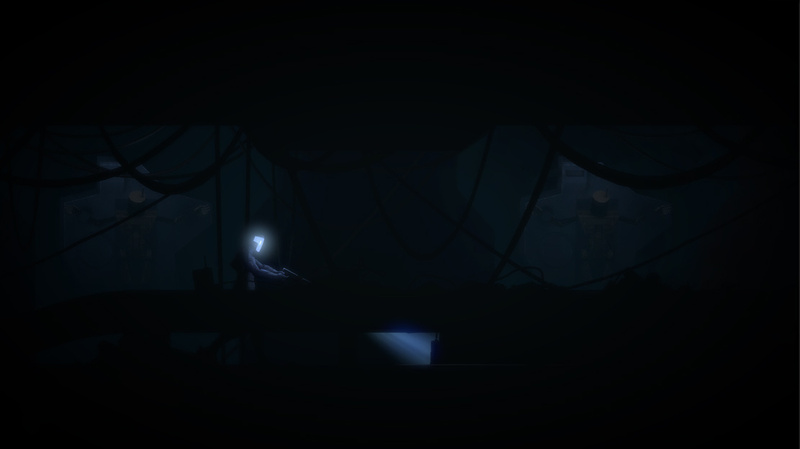 The dark ambient makes finding items really a "search blindlily through the environment" task most of the times though, but it is a really clever adventure game. Sounds better than I expected, but that's not saying much. If they can fix what sounds like awful controls, I might actually check it out. Interesting. Too bad EU has no release date yet, this sounds really good! I have been enjoying it quite a lot, despite getting thoroughly lost. And what gives? You guys have really been slowing down with your reviews. Yeah, I've been thinking that Reviews are lacking of late. Wonder why? Too many games being released? @conman2012 I had the same thought. Bring back @SpaceKappa! My three favourite Wii U eShop games received a 7/10 (or 6/10) on this site (Scram Kitty, Toki Tori 2+, The Cave), while many disappointing games received 8s and 9s, so this is hopefully another hidden / underrated gem. I really want this to be available in Europe soon. And rather not wait months (I'm looking at you, Shovel Knight and 1001 Spikes). It's actually really funny to me, as this game's voice acting is seen as a 'major flaw' or 'stumbling block' but on a multitude of other websites, the voice acting was actually praised. I find the game would lack alot of emotion without the voice work and to be frank, Nintendo gamers are the last people to be selective about voice work. Silent protagonists and unlistenable anime style dubs? Versus competent voice acting? 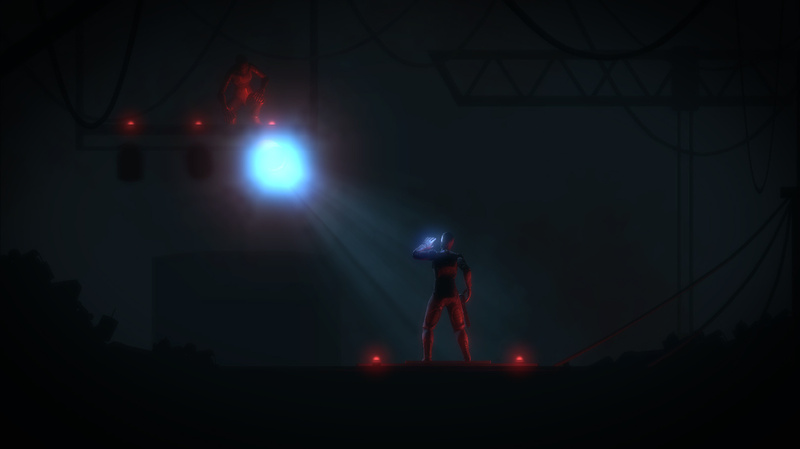 It's like Metroid meets Bioshock in a point and click, slowed down interface. The reviewer must have tried speed running the game, as I found everything necessary to be easily accessible and the controls nuanced and well integrated. Reading this again, I know EXACTLY what Mr. Shapiro was expecting, a hint given away by the 'author info' beneath his picture. No, Jake. This isn't Metroid. With its same song enemies, over sexualized lead character, atypical, virtually unchanging gameplay, terrible storyline and virtual non-existance (at present), I'm actually glad it's not Metroid. Because, to be blunt, Metroid might as well be dead. There have been 3 (3!) remakes of the first Metroid: Super Metroid, Zero Mission and Other: M. And it's not like the first Metroid Prime didn't play like a remake either. Nintendo needs to tear the series to the ground. It's so stale, it might as well die with the Wii. @NodesforNoids Super Metroid a remake of the first Metroid? Metroid Prime feels like a remake too? You look at things in a funny way. @NodesforNoids You may need to recalibrate your definition of a remake. Wind Waker HD is a remake. Resident Evil for PS4/Xbone will be a remake. DmC is a reboot. Your examples are sequels/prequels.The Prime series are prequels to Super Metroid and Other M and Fusion are after Super Metroid. The developers said that they are currently working on a patch for the game and also on the EU release. I will myself look into getting this game when the EU release becomes reality. I'm waaaaaay into this. Right up my alley. I'll wait and try to get it cheap on Steam though. It sounds like the PC version is preferable. Not enough paragraphs for me to read AND feel informed enough about the author's conceptions. Hm. The game is great, but its also a glitchy mess full of freezing. Strange that the other reviews I have read say the voice acting is the strongest feature of the game and never mentioned the controls being bad at all! It's also hard to say a game should have more d pad support just to match the old skool menus. Sounds like the reviewer did not get along with this game entirely but I respect his opinion enough to maybe read up on this more rather than dive in! I got it and played through. I would have given it an eight. The voice acting is actually strong not weak. I like the combat controls as well, it takes skill and headshots are more rewarding that way. The story is full of great dark humor. It did freeze once though. Some of the puzzles are trial and error but they do make sense when you solve them. I was really interested in this, but he control issues sound unpleasant. Never heard of this game until now but I'm very intrigued. I look forward to it releasing in Europe. Decent game, you can get it pretty cheaply on Steam (for PC users). Sounds good too me. I might wait for the patCh I heard about and or maybe a sale since o have plenty to play and Teslagrad comes out this week. I very nearly backed this awhile ago, but I'm happy to wait for awhile for the EU release as I've got half a dozen games on the go right now. The way the reviewer mentions the option 'early on' to tell the truth or lie, really makes me think the reviewer didn't finish the game. The reviewer claims this part 'early on' is really clever, but the way he wrote it indicates that he doesn't know that the option to tell the truth or lie is at the heart of the major plot point of the game! @shauntu I completed it, but generally if you talk about story elements from later in the game, readers will get upset about spoilers. I mentioned that the plot is all about grappling with the concept of robot self-awareness, and I think that's enough to go on without ruining any of the twists. Oh ok, thanks Jake for clarifying and I apologize for the misplaced suspicion! Nice Chumbawumba lyrics!!!!! I get knocked down, but I get up again...they ain't never gonna keep me down!!!!! I like the game so far (voice acting's also fine for me) but for some reason when I was playing the game, half the voice acting/sounds were missing and whenever there wasn't voice acting, the text would skip immediately and I couldn't read it. I also love how the game has no manual (beyond the standard legalese and controllers you can use to play it — with no key for what the buttons do) and does not tell you how to interact with objects in the game world until AFTER you've already reached a point you couldn't get to without interacting with objects in the game world. Got this in the Humble Bundle. Amazing story! I can't wait for the sequel. Respect to the reviewers opinion, but I'm so glad this was not a text only game. The voice acting was terrific, and such a huge asset to the experience!